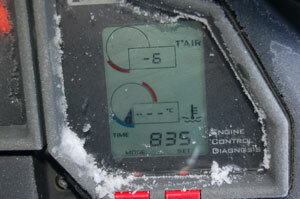 The Aprilia RST 1000 Futura has an ambient air temperature readout taken from a probe on the left mirror stalk. When you switch the ignition on, the default display is the fuel gauge. Push the Mode button once to see the temperature readout, and be prepared for crazy readings when parked in the sun on hot days, but an otherwise fairly accurate representation of how warm/cold it was where you have just been. Press the Mode button again to see the fuel gauge. The temperature range displayed is between -20C (-4F) and 50C (122F). When the air temp hits 3C (37.4F), even if you’re showing fuel level readout, the temp readout will flash to warn you of possible ice. When you switch the ignition on, the default is fuel level display. Just press and release the Mode key to switch to air temp readout, and press it again to return to fuel level display.